I can't believe how fast Christmas has come around this year. 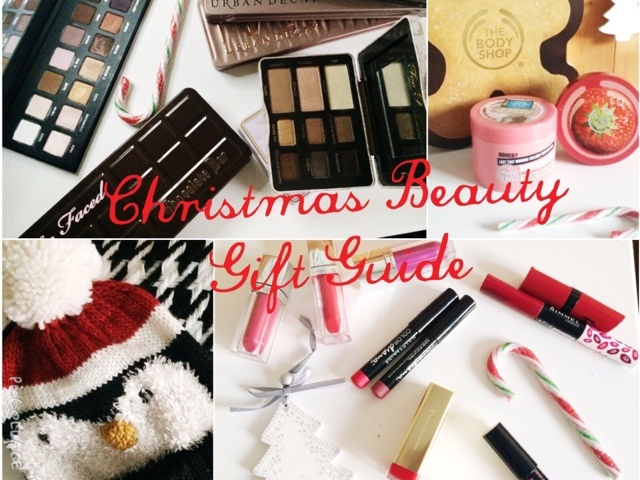 2014 has gone by so fast, so now it's time for this years Christmas gift guide. This is part 1, where I'll be going through a few ideas for beauty products that you can get any girlfriend, mum, sister, aunty, daughter, or whoever you need to buy for. Not only is this hopefully going to help you get some ideas for other people, it's also a great way to get some ideas for something you would like to ask for for Christmas. 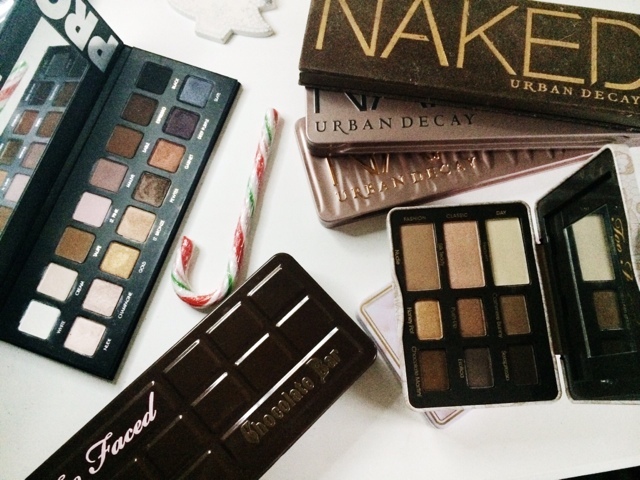 Urban Decay Naked 1, 2 & 3, Lorac Pro, Too Faced Chocolate Bar, Too Faced 9 shadow palettes. These are all really great quality, they range from different prices, and some are available only in America but you can get them shipped here or look on Amazon as they often have them. 2. Or if you know someone who is more in to their winged liner, you could put together a little gift pack with a few different liners in, including some snazzy glittery ones (there's something about a black winged liner which has black glitter on it that really jumps out to me). 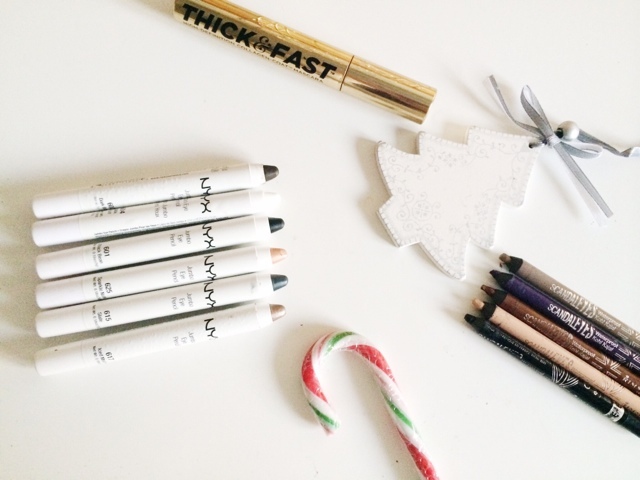 Throw in a mascara or two and a kohl eyeliner and you have a perfect little gift set that you've personalised to fit the person you're buying for. Or you can get one already put together from Urban Decay which has a lot of different shades in from bright blue and teal to silver and bronze. Plus, their eyeliners are top notch. 3. If you don't have anyone that would like an eyeshadow palette, then buying some lip products may be more to their taste. This can be any lip product, gloss, lipstick, crayon, lip balm, or a lip stain. There's a few ways you can do this. You can pick up a ready made set which lots of different companies have, like Soap & Glory, No7 or Seventeen. Or you can select your own and make them into a personalised gift set. They can be all from one brand, or from different ones, they can be one particular kind like crayons, or a mixture, you can really pick and choose exactly what you think they'll like. 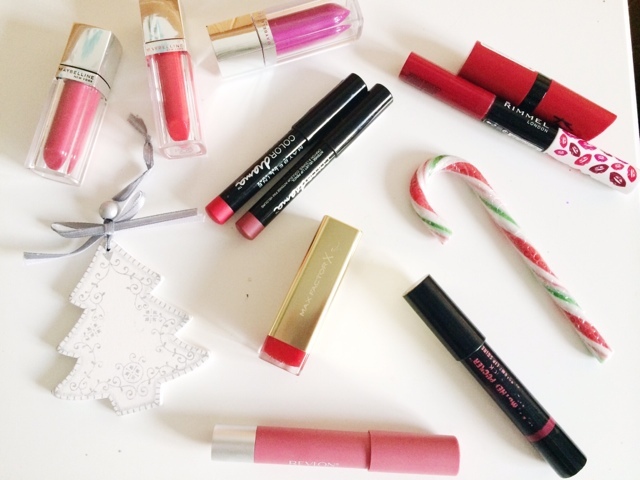 Some of my favourite lip products are from the likes or Rimmel, Maybelline, Revlon, Sleek and Clarins so there's lots to choose from for all different budgets and preferences. Look at how beautiful and sleek the Maxfactor lipstick looks in gold packaging. A few of them as a gift would look amazing. 4. If they're not into lip products or eyeshadow palettes, then a face palette may be more to their liking. Soap & Glory have one of these at Christmas but so do many other brands like Sleek, Hourglass, NARS, ELF, and Benefit. 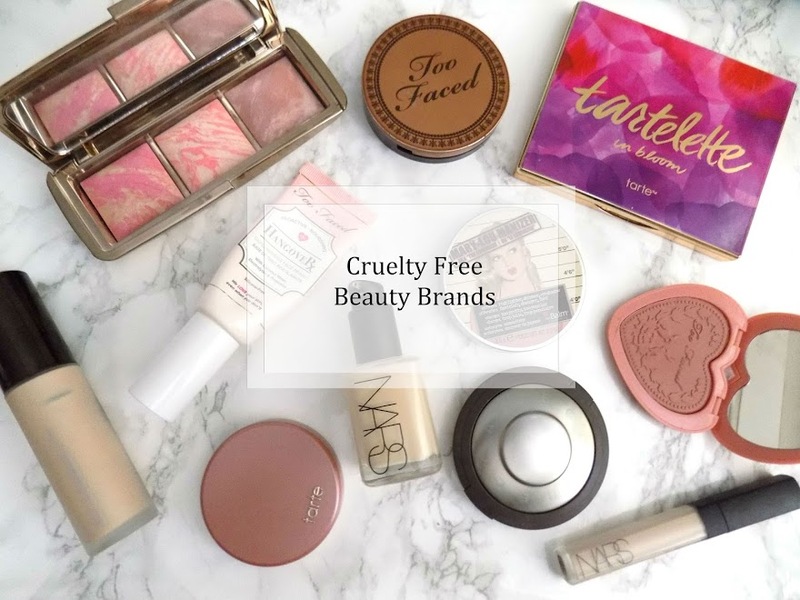 There are some great options this year and all of these products are ones I highly recommend and there's something to suit every budget. 5. 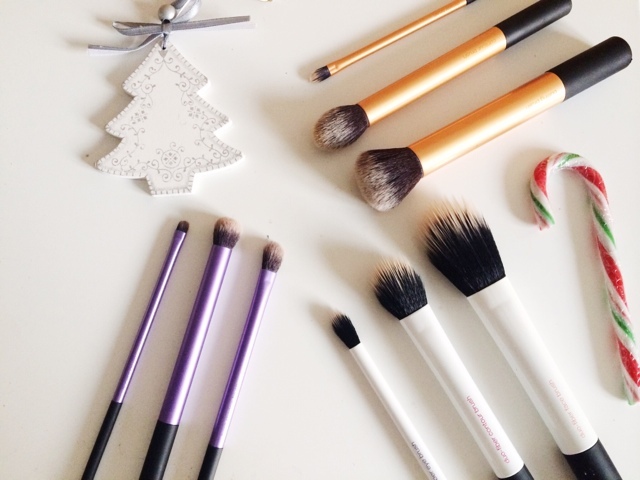 Real Techniques Brushes are a great little gift to buy someone who is getting into make up and needs some good quality brushes. They're affordable, great quality and they'll last a long time. You can buy them a collection with a few brushes in, or buy the separately and include some other ones. EcoTools brushes are also really great quality and are affordable quality brushes too. 6. Onto nails, and this is another one that can be done in many different ways. You can either buy the nail polish sets that the brands have already put together. Or, like me, you can choose some of your favourite colours, textures, finishes, put them all together and give them to a friend or whoever you're buying for. That way, you know all the shades are nice and will be used. You could also put together a little manicure set, Soap & Glory have one and so does many other brands, so they have everything all in one place in a nice little tin or bag. Add a cuticle balm or oil and a nice hand cream and they're good to go on the manicure front. 7. Skincare is a very personal thing, so unless you are very clued up on their skin type, you have to be quite selective and very careful. Try and go for something you already know they want, like, or use. Or, you could go for a gift set pre-selected or customised by yourself. I would recommend going for something which is suitable for all skin types. A nice face mask or moisturiser is a great place to start. Something that is universal and preferably something from a brand you have used and trust. Maybe a product you love. 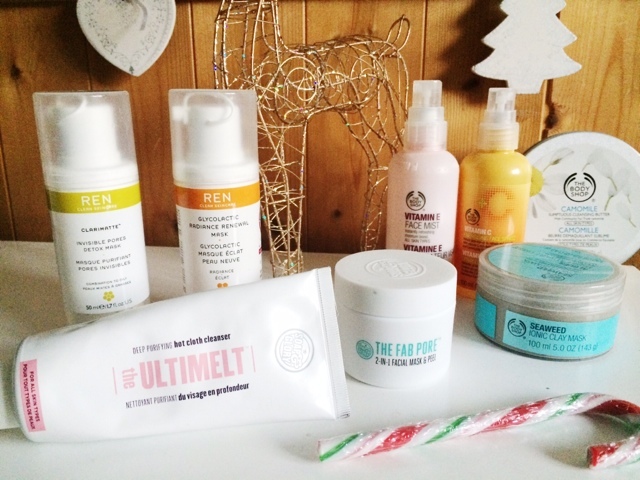 There are lots of brands that have pre-made gift sets, but in particular Soap & Glory and The Body Shop would be the first place I looked though. The Body Shop has a lot of ranges for all different skin types so it could get over whelming, you could go for the gift sets they already have, or you could go round each range and pick out maybe a face mask or a facial spritz. It's better if you have personally tried them so you know how they work but if not, you may want to ask someone what are they're most popular products suitable for all skin types. Are you still with me? One more category left. 8. There are so many bath and body sets over Christmas, it's another section that can get very over whelming. But every year, I get some kind of bath or body product for family members and friends. Again, you can go with the ready made gift sets, or pick and choose different products. Soap & Glory have some amazing bath and body products and have some incredible gift sets at Christmas and they're almost always on 3 for 2. They're range is always growing so there are so many new products to try. I would be impressed if someone had used every single product from S&G. Sanctuary is in the same aisle and they're are some great products in the range. They have mani different scents and lines now so there's lots to choose from. But, my favourite is The Body Shop. Their body butters are so amazing and so popular, especially the limited edition Christmas scents. From body polish to body oils, this brand are incredible with their mission and philosophy and the products are awesome too. Sorry if that was very long, but I wanted to make sure I give you plenty of ideas. On ?? (Wednesday) is part 2 to my gift guide which will include some stocking fillers, gifts for him, and some fashion bits too so make sure to come back for that. What have you asked for for Christmas this year?